iamqman's review"Great lunch box amp!" Finally Marshall has manufactured an amp that goes back to the roots of what made them one of the best if not the most recognizable amplifier companies in the world. This class 5 is an astonishing amp that is simple in design and control, but carries a huge classic tone and feel that keeps you interested in the tone. What is great about this amp is that is it so small and compact that you can take it to gigs that provide a cab and hook it straight up or just running into your favorite 4x12 or 2x12 cab at home. It has two speaker out puts so you can run a 4x12 stack and push 8 speakers of classic Marshall tone! * Perfect head for the Marshall Class5 C110 1x10 extension cabinet! Such a simple and easy design. The front top panel has four control knobs that control the volume and the basic EQ of bass, middle, and treble. There isn't a whole lot the user can get confused with. Just about any guitar you can throw at it you will get a solid classic Marshall tone. I particularly like the amp with a Gibson Les Paul. It seems that the two were made for each other. With only handling five watts of power you can crank up the volume to get those tubes cooking and get a nice over driven sound. This is a great sounding practice amp or light gigging amp. It does have a headphone out for silent practicing in your home or office. So that is a nice feature on a tube amp. It is pretty light for a combo amp weighing in at only 26 lbs. you can basically take it anywhere without much strain on your back. At new these amps come in at around $350 and on the used market for around $200. I would recommend this amp to anyone who needs a great sounding tube amp in the Marshall/British tone vein. MSM-Workshop's review (This content has been automatically translated from French)" Small and Mighty"
All lamps, class A, monkey ended. Cathode bias, so no Bias to adjust, you change the tube without worry. Easy to use but fully understand. First quarter of the volume, clear sound. Past that, the sound begins to crunch slightly right and we will attack the hand and the guitar volume to saturate more or less. At noon it was already a great overdrive that arises. Spent half adding more volume too but mostly gain (too much on the end is rough) and even SAG limit. The sound is clear, yes THE sound because obviously this amp produces a single sound, he does very well. If you do not like this particular grain then there is nothing to expect from the class 5. The clean sound is good. It is round and warm, it feels light on the sound, the more the volume is frank, most natural compression is felt. Its only flaw is that low volume, it lacks shine. The sound tends to be very dull and too round. So I changed to keep shining in the first quarter of the stroke volume. Sound breathes better, let the harmonic richness speak (more than double the franc strat, of course), and the violin makes its full potential even at low volume. None, I do not understand the Marshall on this one ..
Then, the more you shoot, the more saturated, like the old plexi heads and consort but with the advantage of lower power. The overdrive is clean until two thirds say, a distinctive and typical sound, the british possible. TIP: To keep longer subject to its clear (headroom) is grafted him a lamp in 5751 V1. To calm down the fury of the amp and which can delay the arrival of crunch. Small + welcome. For rehearsal / concerts, if you need a clear, you should test it ... maybe just a little. The trick of 5751 will be more than recommended. For crunch ect, provide a small overdrive pedal that will be set at the right volume and enjoy the gain needed to walk. Incidentally, this amp is a marvel for its effects, particularly on the front passes. A good little amp in good order. It inspires confidence, even in the lead. (Model which does not suffer from vibration issues combo.) The finish is nice, the sound is good. Apart from this lack of gloss, no complaints! It is obviously limited in its sound, it does not send itself to everyone but if you like then this is happiness. Limited on amenities (reverb, loop) Anyway it's also the "spirit" that want it ..
horsforfait's review (This content has been automatically translated from French)" The Marshall sound, true!" All lamps, a jack and a headphone input behind. 5 watts, but only 90% of musicians. Input for speaker 8 or 16 ARO. No reverb damage. It grows stronger, watts to spare! Here, we will make fast: low, medium and high-pitched. Volume and the rest is all. To get the sound that goes well, you also have to play with the knobs on his guitar, like the good old days. It is simple and subtle at the same time. A very nice clear, warm, round in the first quarter, then a crunch dense and precise finish in a tough distortion but losing accuracy in measurement quel'on up the volume. I play a Gibson Les Paul standard equipped with humbuckers and a gorgeous Squier Telecaster Classic Vibe 50 equipped with simple microphones, fender american vintage. In both cases, nothing to say with this marshall head with a soft spot with Gibson. It accepts pedals well, but I'm more of a fan of "plug and play". I have a PROCO Dirty Rat, and there it sends severe without flinching, that little head Marshall is doing very well again. fhebert's review (This content has been automatically translated from French)" Tete classic 5 PIN UP: tool for pedals to record or play live"
Head marshall 5W Pin Up series, brown leather with a beautiful Pin Up on the speaker with a 10W speaker, all made in England, good workmanship. Big power, nickel or repeat play live. -Simple settings, it still sounds good, careful not to put too much bass with Gibson. A single channel, no loop or reverb, so they need a few pedals with more sounds. No need to book, the sound is very warm and organic, ca reacts really well, if you play it cool or attack. Everything is very light, so easy to transport and set up. I did my first gig with 10 days ago, no need to take in the sound, I played more than 3 hours, the volume 4! For blues, you can just play with the amp, for pop, funck or rock, it will add the pedals and they sound great on this amp. With the pedals can have everything to do with, it takes great pedals. There is one clear rule or its slight crunch in its core and reverb pedals lead / delay or boost and saturation. It should rather play with simple microphones to cover an acoustic drum in its clear focus is clear sound Marshall, Fender not crystaline, it will take a small compressor or a small booster effect VL kind. Crunch sounds sounds top, perfect for rytmiques blues, rock and pop. then with the boost or OD pedals or Disto, we feast! The MUST: the new RIFF SHOOTER made by Judge Fred, or OD JAM (pedals shops greece). Super nice, lightweight, good sound, good construction and suitable for the pedals. cyrille young's review (This content has been automatically translated from French)" magic"
Head lamps 5 (large) Watts Class A 2 ECC 83, 1 EL84, three bands equalizer (more effective than usual marshall) a volume for the front ... the rear exit 8 or 16 ohms, and headphone. In short, the strict necessary. Configuration could not be more simple, useless manual, the sound is always good!! Suited to my style of music that is the big blues rock, hard rock short of Bonnamassa to gunsn'roses through zz top and AC / DC. ---- After 15 days of testing I can finally give an opinion. I already said that this is my second head 5 watt lamps ... I had a blackheart little giant 5W. And even if it is a very good amp, I do not regret .... we are not in the same budget!! ----- Sound: Very organic, that's what pretty much sums up the rendering .... I connect the head to the house in an old Marshall cabinet with 1 X 12 HP greenback 25 W. And here I must say that it is happiness. HP ideal in my opinion. ----- This head serves me home with an attenuator P & P (nickel) and rehearsal is connected on a 4 X 12 (marshall in G or harley benton 12-65 V 30) and even with a drummer banging hard, the volume at 4-5, I'm very limit! solo and with the boost to +8 db, I spent nickel above the mix .... I have yet to test but in concert in bars, the fact that nickel ... Just do not need too its clear, because even if the amp is responsive to volume, it is less responsive than my marshall 2466 head, which is really great! ----- Short for big sound hot sauce Blues hard rock, not too strong, not heavy, easy to carry (especially the head, if it has a baffle in a local association ...) A must see!! damage that has stopped its manufacture marshall!! Linn Sondek's review (This content has been automatically translated from French)"Fantastic!" The fantastic feature of this head are now well known, but too bad I remember! <br>5 watts in pure class A <br>Volume and 3-band EQ <br>and this is for the front! <br>At the rear, not much actually: a headphone output that can be converted into power attenuator does enclanchant jack to the speaker only halfway and two HP ports 8 and 16 ohms. <br>One could say that this is spartan but this is how designed this amp. We know perfectly at the time of purchase: so there is no misrepresentation of the product. <br>Minimum setting on the path of modulation, as in high fidelity, it is in favor of the sound quality. <br>For me, this is perfect. The configuration is, not surprisingly in view of the few settings, you can not simple. The manual is not essential, far from it! But few settings does not mean little sounds. Firstly, we must salute the effectiveness of settings bass / mid / trebble that are sensitive, progressive and interact with each other. It has a beautiful palette of shades that allow many variations and allows her to find THE perfectly suited to personal taste. Head, a compact volume and weight rather light, is easily transportable and fits over any cabinet. So yes! this amp suits me perfectly. I bought it knowingly and I find it fantastic. The sound is clear up "to 4 with Stratocaster gone up nearly 3 with a Les Paul. Past these limits, we obtain a splendid crunch, more marked as and as you push the volume with compression music, beautiful but still leaves the dynamic expression. dynamics For what! Connected HP Celestion Vintage 30 or Eminence Red Coat Governor (and better: the two at the same time), the Marshall Class 5 offers exceptional dynamic. The game the right hand here, bit of everything and it is he who makes an LP cruncher volume 3, because if you play arpeggios, the sound remains clear and as soon as you attack the strings crunche.Et as its head responds particularly well to tuning knobs guitar volume, you can imagine the infinite nuances that it is possible to get. An example: a 90-MXR Phaser which brings a boost to start and a slight crunch coupled with a LP, I adjust the volume of Class 3 and 5 of the knobs on the LP respectively 5 (neck pickup) and 7 (bridge pickup) and I get a pure clear sound arpeggio crunch as easily attack fingers or when starting in rhythm and amount to 10 volumes of guitar pickups, a crunch intensified. Note that the head is really a friend of effects pedals and even the modulations, front, sounds wonderful with a good crunch sound. So there is really no regret to have on the abscence of an effects loop. Stratocaster is a particularly comfortable on Marshall, My American Series 2006 sounds to perfection. So I appreciate the full extent of this amp sound. At bottom, the key to a distortion of confusing because the sound quality is still articulated, and again and again dynamic. Long time ago that I was lusting over the head and the price charged by our friend Thomann last week that I was not immediately blown. I first read when I hallucinated € 280! And no he is not back with stock client or cosmetic defect, and yes, the head is made "In UK"! I played a lot of amps and I have an old Fender Hot Rod Deluxe and a U.S. HT5R Blackstar head. So I know a little about. So yes! definitely yes! this head is an incredible opportunity. It would be its price "advised" a little over € 400, while less than 300 is just miraculous. And at the same time, it reminds that it is always possible to make the material accessible in Europe. Maybe some of vouis they arise the question: "Well, since you have two heads 5W price roughly equivalent, which do you find better?" From a sound point of view, without a doubt, the Class 5. The Blackstar does not, however pale but did not play in the same category: its strength is its versatility makes it comfortable in all styles and connectivity perfect for home-studio (in extent that it does not wish to go through a baffle and microphones). 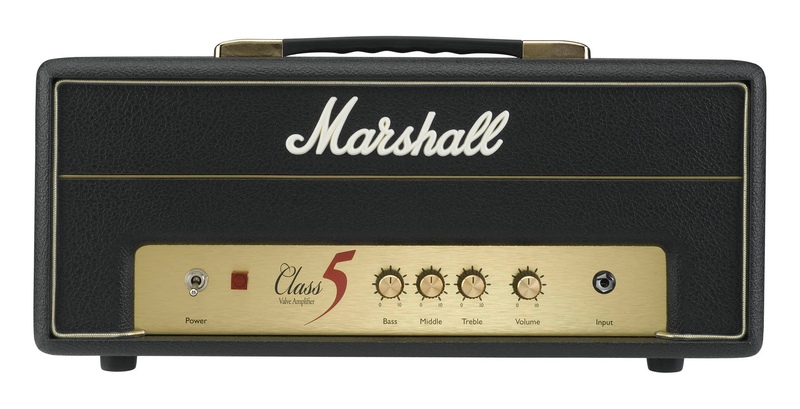 The Class 5, and although it is precisely the pure class, a small miracle in which Marshall thought of all those who can not or do not want to push 50w amps and more in their last ditch to qualify for the best possible sound. So, in my humble opinion this is the best quality / price ratio of the time and yes, I do it again this choice without hesitation, even 400 €! Djyne's review (This content has been automatically translated from French)" Mini plexi!" Then it's BIG 5 WATTS. At home I connect my Orange PPC212 cab (with 2 Celestion V30 home) on the output HEADPHONES output is attenuated (basically a built-in attenuator) compared to normal output with jack down to half (since output stereo). I use again in the normal output 16 ohms. Perfect for blues and rock. Basically it is the sound plexi at low cost and low volume. + As explained above, to beast cruncher in the apartment on the normal output is already too much! With headphones it's nickel output: almost the same sound - very manageable so apart. Principle identical to the complex: it increases the volume + and + it crunch. So from 2.5/10 (with single coils at high output on my Telecaster G & L US) it starts to cruncher with a volume already 75% of max volume. So little of his light except with the knob of the guitar. Then the distortion increases gradually as one increases the volume knob. This is pure Marshall crunch as we love it! If you love me like J. Page, Hendrix, Clapton, The Black Keys, The White Stripes DARK buy it! VERY transparent amp, I rediscovered my guitar! Take the pedals very well. with a slightly crunch takes pedals very well. 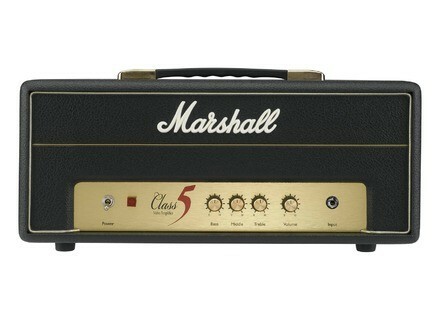 So I will buy the same at 50W (which inspired the 1959): Marshall 1987x head. I've had two weeks and I do not intend to part with it. I tried other models but I wanted to sound "pure" direct, no frills. I just sold a Marshall JVM 215c combo 6 channels without any regret, because this amp really has a PUR her in every sense of the term for a great price. And something is not said enough and difficult to describe this amp is very responsive to the game, very dynamic. I do it again the same choice again.